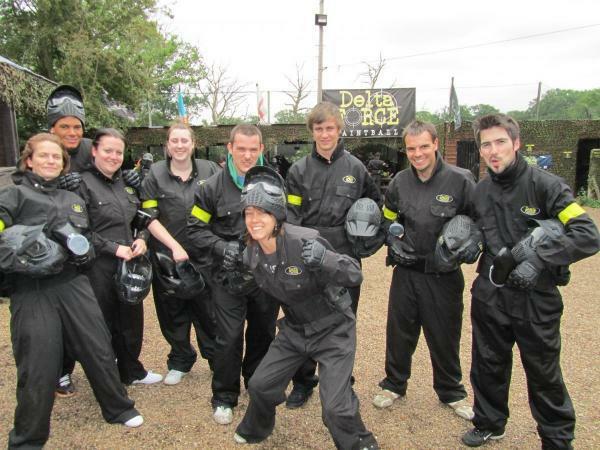 Delta Force Paintball recently hosted a great team building day out for a London firm of couriers at our paintball centre in Hemel Hempstead, Hertfordshire. The MD had arranged for various depots to come together from all over London to assemble for a day of paintball action to determine which depot would take the honours. The company spent the day participating in a number of paintball missions including Black Hawk Down and Castle Wallenberg, with the overall winners being declared after game 12. It was a closely fought contest with the scores remaining tight throughout the day, the red team narrowly outpointed the blues in the final two rounds, giving them a victory by four points. There was a resounding cheer form the team when they were declared the winners. MD Brian Williams was delighted with the way his drivers had risen to the challenges. He said “it was great to see the drivers responding to the tactics and strategies suggested by Delta Force staff; the game has brought some excellent leadership qualities out of the guys. Some people whom I did not think had it in them have certainly come to the fore today. All in all it was an excellent decision to hold our team building here at Delta Force Paintball, we will definitely be back next year”.